It’s been longer than I planned, but here’s the continuation of my Chanticleer visit. Part 2 of the visit picks up at the tennis courts, a part of the gardens who’s former function should be obvious! The flat area that used to function as the court has been turned into a group of five beds filled with all sorts of interesting plants. My favorite was this one which leans towards a yellow theme. 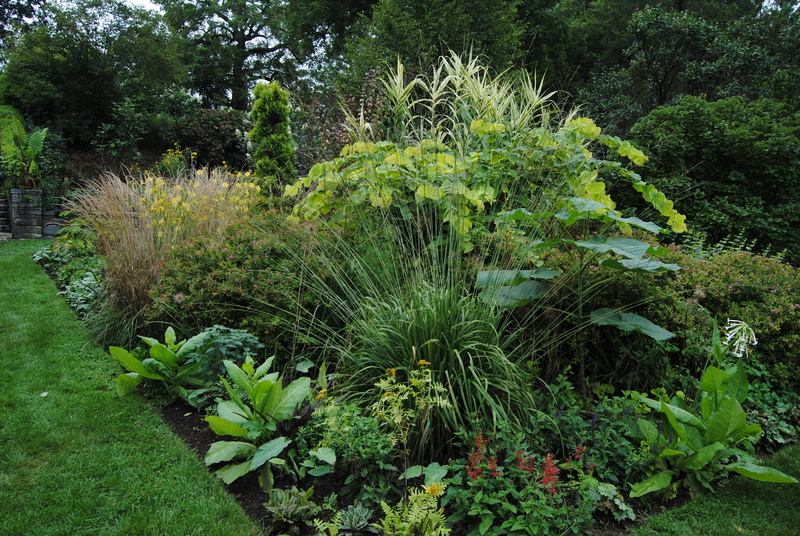 A redbud with yellowish foliage anchors the bed and a nice clump of the tall variegated arundo donax grass is peeking out from behind. For a late season garden it still looks good. There was plenty going on around the garden with cleanup and cutting back, I don’t know how it is on other weekdays but during my visit the place was buzzing with garden staff. Here’s another view with a nice banana, some of the annual purple perillia, and a couple of those dead looking brown sedges. 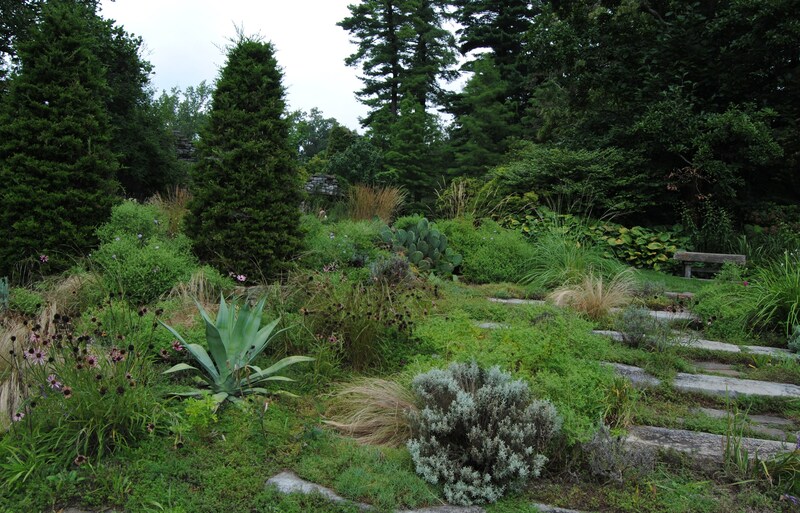 Grasses and sedges seem well used around Chanticleer and they do add long season airiness and texture. Beyond the courts is the cutting garden. The Chanticleer interpretation is more like a wild ocean of frothy flowers, some of which top out at over 10 feet! A cool garden to wander through since it comes in on you from all sides. You can just make out the asparagus hedge that closes in the right side here. A little structure in this garden is given by the archways. I’m stealing this idea since it’s not tough to copy. A rebar arch forms the basis while vines and branches are twisted around…. since I already have the rebar arch set up, no problem-o on twisting some twigs around! The tall orange sunflower-ish plants are the annual tithonia. It’s supposed to be easy from seed but I’ve never had much luck. It sure did well here though. This path leads to a small fenced in vegetable garden, a nice little spot to take a breather on one of the vegetable themed benches. 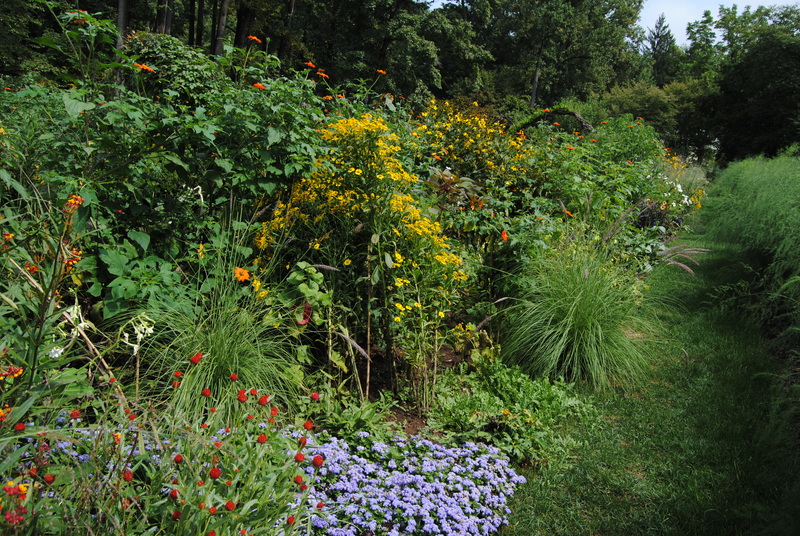 For as wild and bloomy as the cutting garden is, there were still a ton of late bloomers left to come, so I bet this garden comes to a peak in about another month…. in case you’re still considering a visit! A relaxer next. 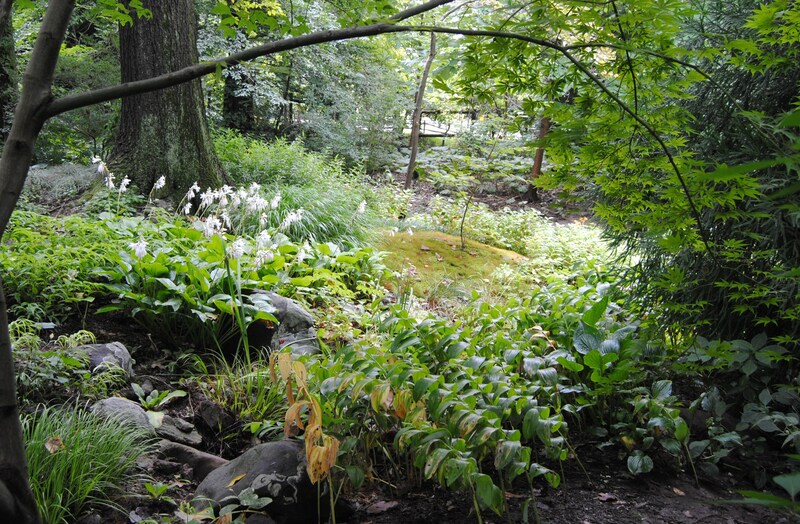 A woodland section called Bell’s Woods is a streamside collection of North American plantings. Even though it probably peaks in the spring there were still plenty of cardinal flowers (lobelia cardinalis) in bloom. 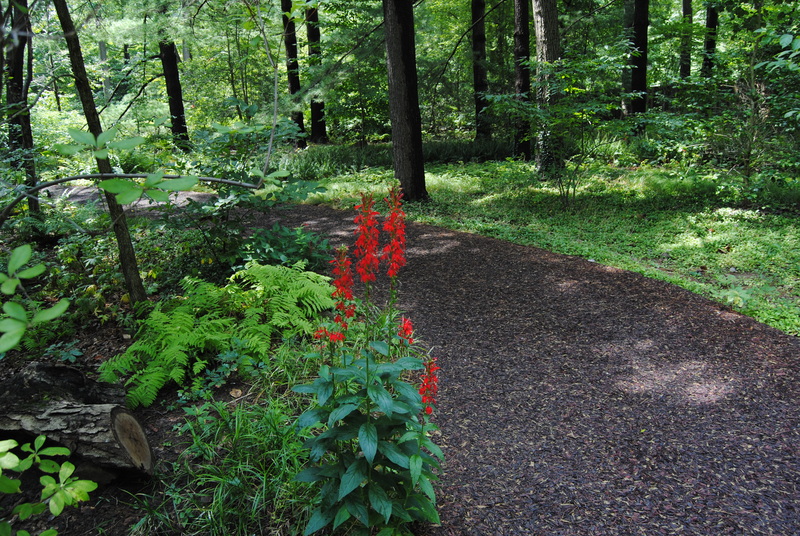 It’s a nice soft stroll since the “wood path” is actually a soft rubber mat that looks like wood chips…. or at least that’s what I read… even after being told, I still thought they looked like shredded bark! 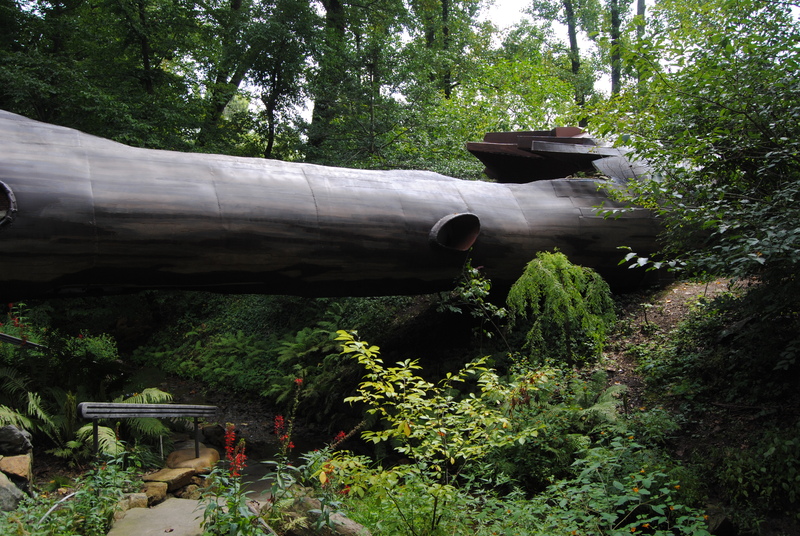 Throughout the gardens are bits of functional art such as chairs, railings, and this metal “hollow log” bridge. 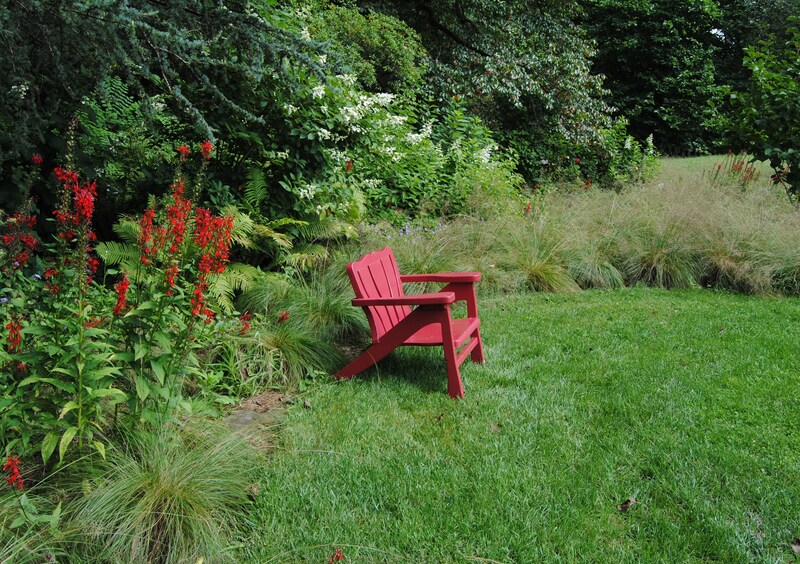 Even though Chanticleer is a relatively small garden and heavily planted, there are still plenty of restful areas, many of which have a nice seat and an excuse to linger. And nearly all are somehow color coordinated! Around the red chair you can see some clumps of prairie dropseed. It’s a native grass used as a kind of lawn replacement for many of the open areas beyond Bell’s Wood. It’s also probably my least favorite of the plantings here since I just can’t get past what Wikipedia refers to as a “vague scent of popcorn, cilantro, or sunflower seeds”. I just call it stink, and forgive me if we skip this and the ruins garden and head straight to the gravel garden. The gravel garden is a very un-Pennsylvania bit of sloped, well-draining garden that is filled with plants better suited to a more Mediterranean type environment. It’s a bit of surprise to see hardy cacti, yuccas, and agaves this far north, but apparently they like the winter drainage. 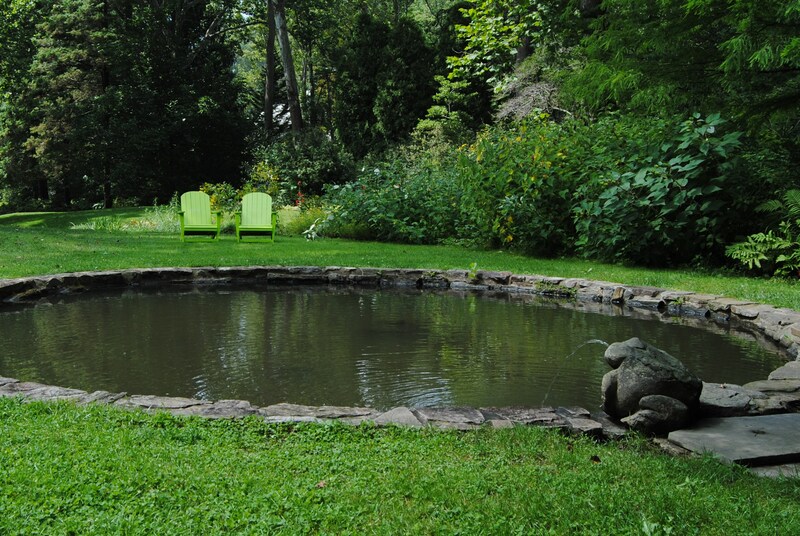 The gravel garden tumbles down to the antithesis of good drainage, the pond garden. I love a nice pond (unlike my pathetic leaky pre-formed) and this one is just surrounded with a nearly wild planting of moisture loving growth. 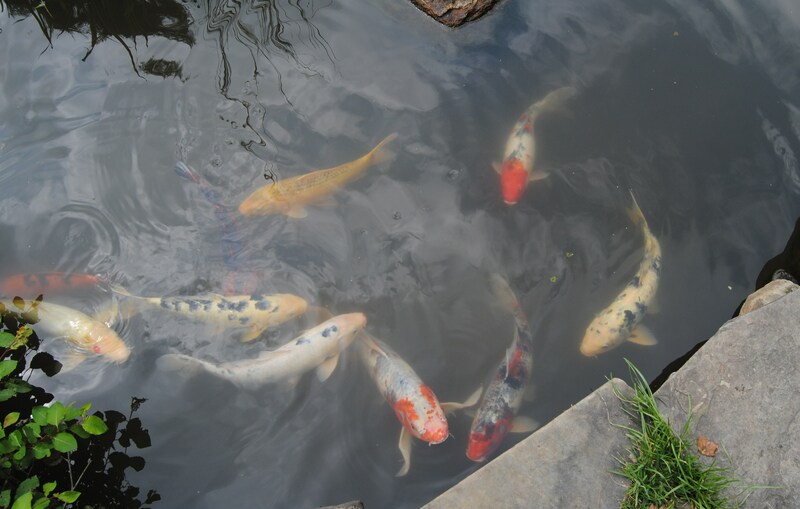 Well fed Koi are always fun too. I loved the pond gardens. 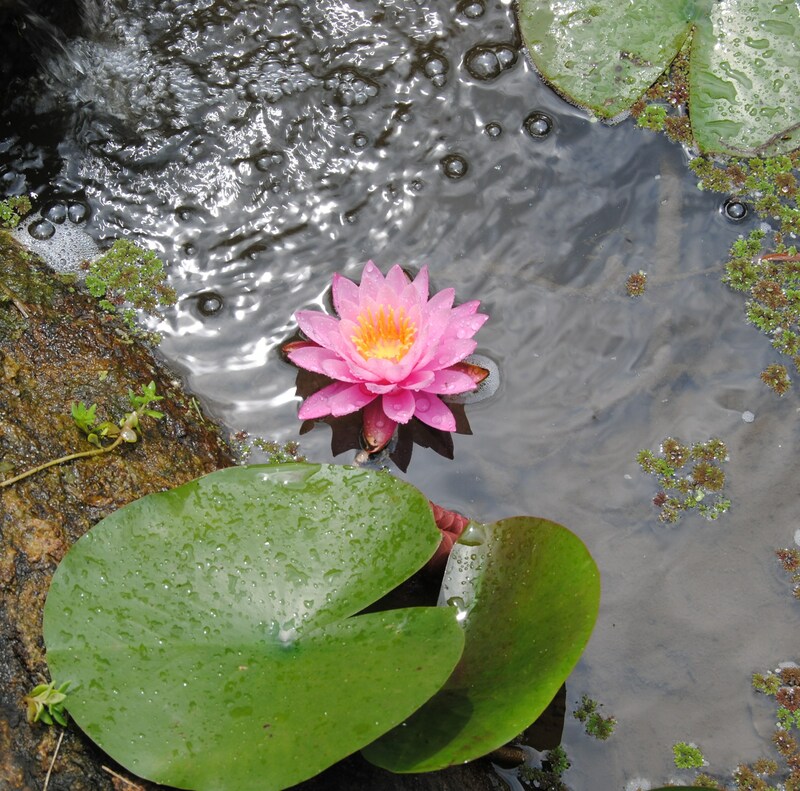 If I had more room a big waterlily pond would be near the top of the want list. Waterlilies are just so saturated with color, so waxy and lush, that they just draw you in. This one was nice and close to the pond edge. My want list also got a new plant added. 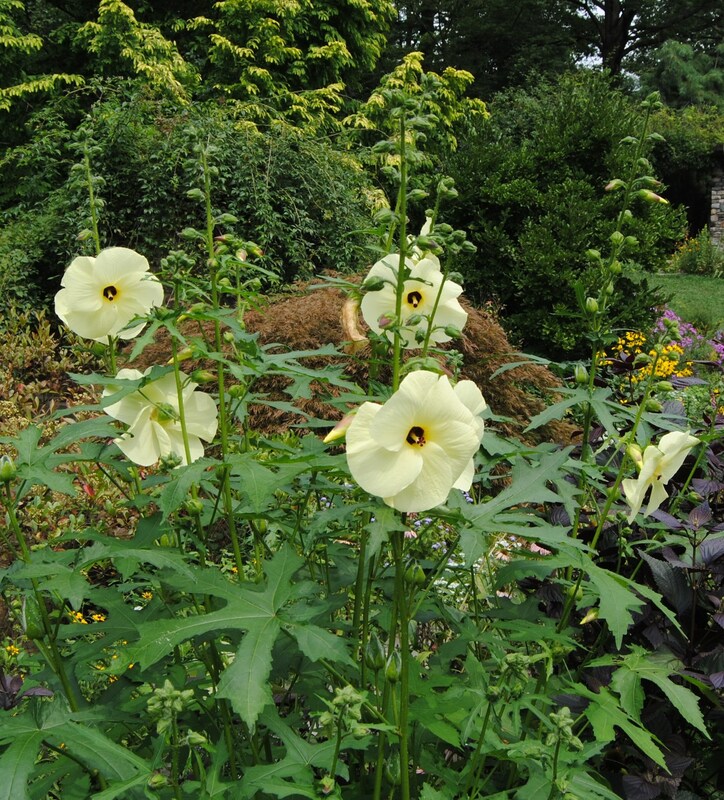 This yellow hollyhock looking plant is abelmoschus manihot, an annual that I eliminated from a seed order last winter and now wish I hadn’t. It’s sometimes referred to as sunset hibiscus, but it’s actually a close okra relative… that means nothing to a Yankee like myself, but southerners may weigh in on that! I think I’m about to overdo the pictures here, but there was so much to see. 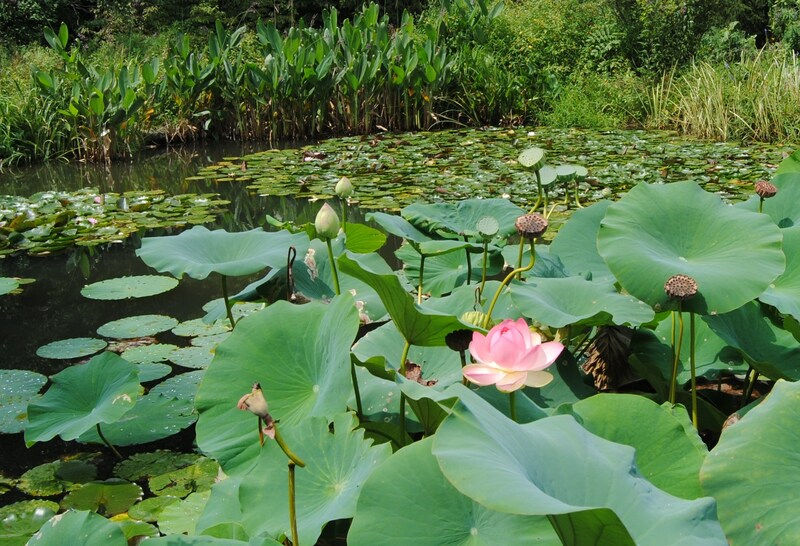 The bottom pond was given over nearly entirely to sacred lotus. Lotus is so cool in the way the leaves stand up above the water, the oversize leaves and blooms, the water beading leaf surface, the shower head seed pods…. You know if I had the room I’d grow this one too! Asian woods next. Restful and green…. too many pictures already so I’ll move on! I was a little thirsty and just had to stop at this. Every little bit of this garden is thought out and then re-thought out and it shows up in all the little flourishes and details. 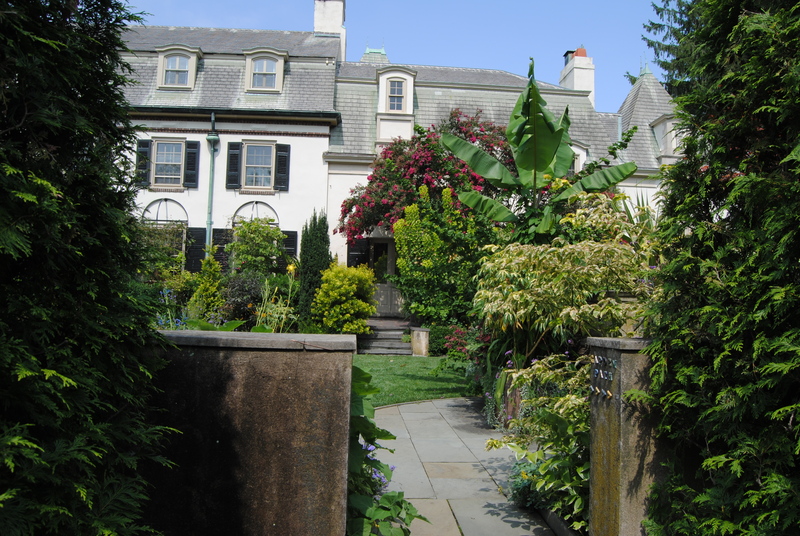 My last stop on the Chanticleer tour was a stroll around the terraces of the main house. If you thought this post was picture overkill there’s still more to come. The terraces contain all the stuff I really go for like bold colors, overplanted beds, fat container plantings, and tons of tropicals. Hang in there, it’s the last Chanticleer post! 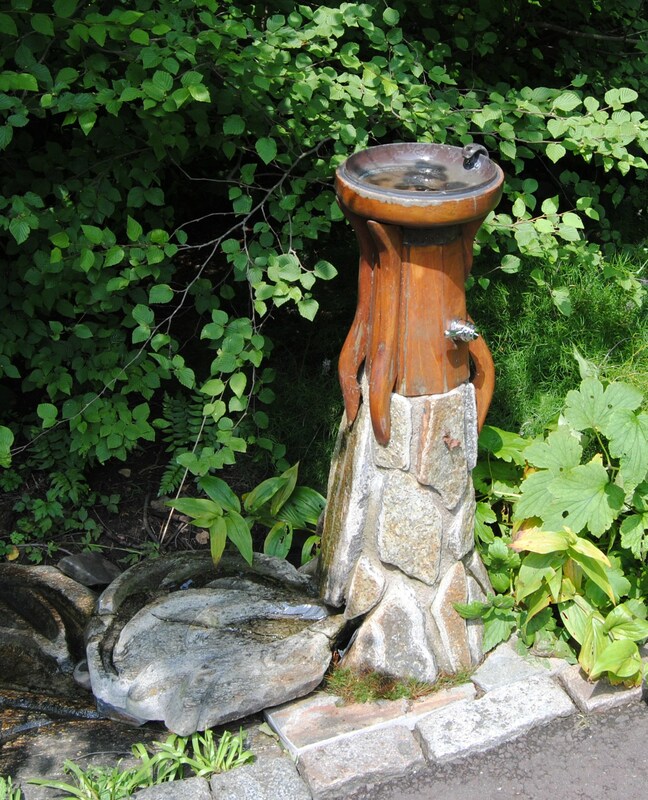 This entry was posted in garden tours, late summer and tagged chanticleer, cutting garden, garden art, garden color, garden design, garden photography, garden seating, garden visit, Great gardens, pond garden, public gardens. Thanks for the tour. Enjoyed seeing the pictures and reading your impressions. (abelmoschus manihot does remind me of okra).